Motorcycling is increasingly popular among a broader group of people. There are currently more than two hundred thousand registered motorbikes in Ontario. When asked why they enjoy motorcycling, many avid bikers say that it’s about the passion and thrill of being on a two wheel machine on the open road. Part of the thrill comes with the inherent risk of being in a completely open and unprotected space, along with the high performance and speed capabilities of a motorcycle. All the same, no rider wants to be involved in a motorcycle crash that may result in serious injuries or death. The vulnerability of someone in an open and unprotected vehicle such as a motorcycle, greatly increases the risk of serious injury in a crash. Although motorcyclists are sometimes solely responsible for their own collisions, often car and truck drivers do not pay proper attention to these smaller vehicles, and the carelessness of these other drivers can result in catastrophic consequences for the motorcycle rider(s). Motorcyclists who are injured in collisions resulting from other drivers’ negligence are entitled to compensation for damages for all the losses caused by their injuries. The Injury Lawyers of Ontario (ILO) law group are specialists in negligence suits and disability claims, particularly resulting from motorcycle collisions and other motor vehicle accidents. On any summer weekend in Ontario, there are reports of motorcycle crashes with tragic results. One such incident occurred in June of 2015 on Loyalist Parkway east of Belleville, when a Mazda Miata crossed into oncoming traffic and collided head-on with three of eight motorcycles that were travelling together. This terrible accident resulted in the death of two motorcycle riders and serious injuries for another. The two occupants of the Mazda were seniors and suffered life-threatening injuries. The motorcyclists who lost their lives in this crash were 46 and 58 year old men, one of whom just newly became a grandfather. The three bikers were members of a 1st Canadian Army Veterans motorcycle group. There has been a demographic shift upwards, in the average age of motorcycle riders in the past two decades. A 2012 research study by Browns University found that older riders have a significantly higher risk of greater injury from crashes. The risk is three times that of young riders (20-39) for riders 60 and over, and two times the risk for middle aged adults (40-59). Older adults more commonly suffer upper body fractures, while younger riders experience more arm fractures. Serious head injury is the most common cause of death for motorcyclists of any age. The Insurance Institute for Highway Safety sites helmets as the most important precaution in preventing motorcycle deaths (37 per cent effective) and traumatic brain injury (67 per cent effective). Essentially, riders who do not wear a helmet are three times more likely to suffer traumatic brain injury in a crash. Another important feature that improves safety for motorcycles, as it does for all vehicles, is the antilock braking system (ABS). Motorbikes equipped with ABS are 31 percent less likely to be involved in a fatal crash. TBI survivors may be left with limited functioning of their arms or legs or in some cases, coma. The negative change in brain function associated with TBI often has a significant impact on employment, family life and social interactions for victims. Death and traumatic brain injury are the most severe injuries that may be suffered in a motorcycle crash. However, there are other injuries that frequently occur, including neck injuries, road rash, arm and leg injuries, and muscle and soft tissue damage. Neck injury is not uncommon in motorcycle accidents and can result in chronic pain syndrome, spinal injury and paralysis. Like head injury, a helmet is a significant deterrent to neck injury. Together, head and neck injuries occur in about 22 per cent of motorcycle crashes. Road rash is the term for injuries that occur when a person’s body slides across pavement in the course of an accident. When pavement rubs against exposed skin or through thin clothing, it may rip away skin right to the bone and can result in infections, nerve damage and skin irritations. Riders who wear protective clothing such as motorcycle jeans, gloves, kneepads and leather jackets are far less likely to experience road rash. Protective gear can also prevent muscle damage in the event of a crash; muscles anywhere on the biker’s body may undergo injury from a violent impact. Orthopaedic injuries such as arm fractures and permanent nerve damage may result when a motorcyclist is thrown off their bike, often landing on their arm. The Center for Disease Control found that 30 per cent of non-fatal injuries are to the legs and feet. Such injuries may result in permanent disability in severe cases. Fractured bones or knees and broken feet can occur during skidding, flying off the bike, or when the bike lands on top of the rider. Any accident involving injuries must be reported. If you wish to claim for any sort of compensation, the police accident report serves as proof of the accident. It’s also vital that you immediately visit a doctor or hospital to obtain a complete assessment of your injuries. Seemingly minor injuries often worsen or lead to more serious complications, if untreated. Additionally, this medical assessment is supporting evidence for the fact that you were injured. In Ontario, there are two options available to any motorist who was injured in a collision, including motorcycle riders. Anyone can make a claim for accident benefits against their own insurance policy, under Ontario’s ‘no fault’ insurance. The accident benefits to which you may be entitled are defined in Ontario’s Statutory Accident Benefits Schedule (SABS) and include compensation for lost income, medical and rehabilitation costs, attendant care, caregiver benefits, death and funeral expenses, and housekeeping and home maintenance expenses. Accidents must be reported to your insurer within seven days or as soon as possible, or your insurance company may reject your claim. Pain and suffering (non-pecuniary damages). This is an amount of compensation awarded to an injured person for the loss of enjoyment of life due to the effect of their injuries. Family members are entitled to compensation under the Family Law Act. Punitive damages. These are awarded in (rare) cases of insurer misconduct, but may apply when the insurance company has breached its duty of ‘good faith and fair dealing. In the trial, Kirk v. Kloosterman, 2011, Mr. Kirk was awarded almost $4 Million in damages for catastrophic injuries he incurred in a motorbike accident. Mr. Kirk was left paralyzed from the waist down following the tragic collision, then while in hospital, an infection in his spinal cord resulted in worsening of his initial injury. The negligent driver was found 85 per cent liable, and the jury deemed Mr. Kirk 15 per cent liable in the accident. Mr. Kirk’s settlement included compensation for loss of past income, loss of future income, cost of future care, non-pecuniary damages (for pain and suffering), special damages, and an in-trust claim for Mr. Kirk’s spouse. The amount of damages to which you are entitled will depend on the severity of your injuries and the resultant impact on your life. About 90 percent of negligence suits are resolved by negotiation before trial. Your personal injury lawyer will gather all the relevant medical evidence, such as health care specialists’ assessments of your current and predicted future wellness. Your lawyer will also review case law precedents involving similar accidents and circumstances that contribute to building a strong case for optimal compensation. 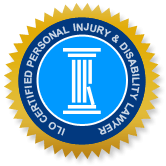 Personal injury law is a specialized field that requires expertise in negligence law (tort law) and insurance law. The Injury Lawyers of Ontario (ILO) are knowledgeable motorcycle accident lawyers who provide zealous legal representation for our clients. We offer a free no-obligation consultation that gives you the opportunity to have your questions answered and learn about your rights under the law. The ILO team includes outstanding law firms in municipalities throughout Ontario, who can offer personalized and local service to you in your community. Learn firsthand why our former clients recommend us for our compassion and work ethic.